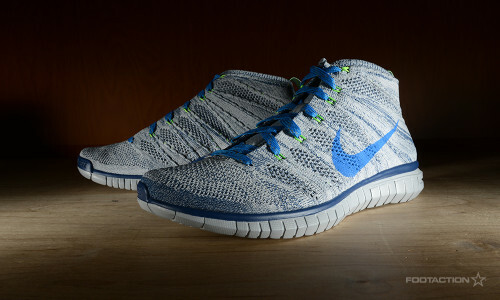 The Nike Free Flyknit Chukka arrives in three different colorways today, and one of the standouts is the Wolf Grey, Photo Blue and Electric Green combination. The shoe is decked out in a lightweight knit upper, while Photo Blue is applied to both the branding and laces while eye-catching Electric Green handles the Dynamic Flywire support and heel pull tab. Feeling a bit of a Seattle Seahawks vibe, and it’s all-around a solid and clean athletic sneaker. Print article This entry was posted by hhcblog on September 1, 2014 at 5:12 am, and is filed under Footwear. Follow any responses to this post through RSS 2.0. You can leave a response or trackback from your own site.